If your business or project has a pool of loyal users who visit your site regularly and might want to leave public feedback about your site or services, then the Guestbook Page is a useful way to enable this and manage these messages. In addition, the collecting of user comments is a very useful and easy way for you to build up content on the site to attract better search engine indexing. The Guestbook lets users post a message to your site, but holds it privately until you have checked it for accuracy and appropriatness. Very occasionally the facility may be abused, so your ability to moderate what is published is useful. 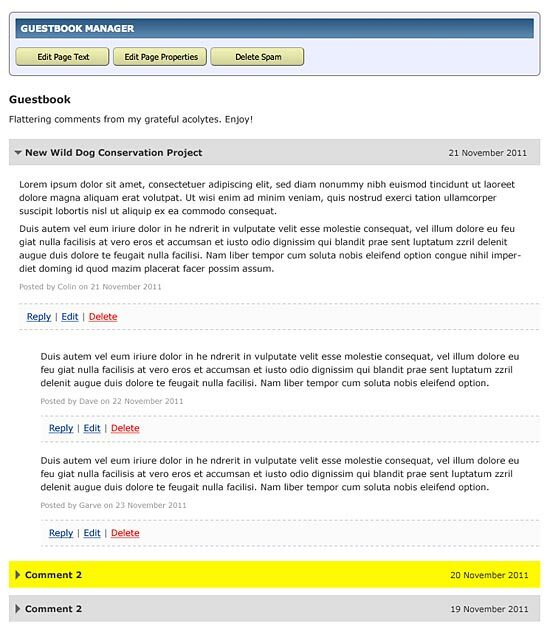 The Guestbook also lets users post followup messages in response to earlier ones, building up a 'thread' of conversation which helps to make your site look more interesting, and also providing 'food' for search engine indexing. As the guestbook grows, older message threads are automatically 'collapsed' to just the title bar, saving space on the page and minimising scrolling, but users may click on any of these to 'open' the mesage thread to read it. Here is an illustration showing an example message thread, with responses indented, and providing a 'Reply' links so that other users can respond to the main posts. 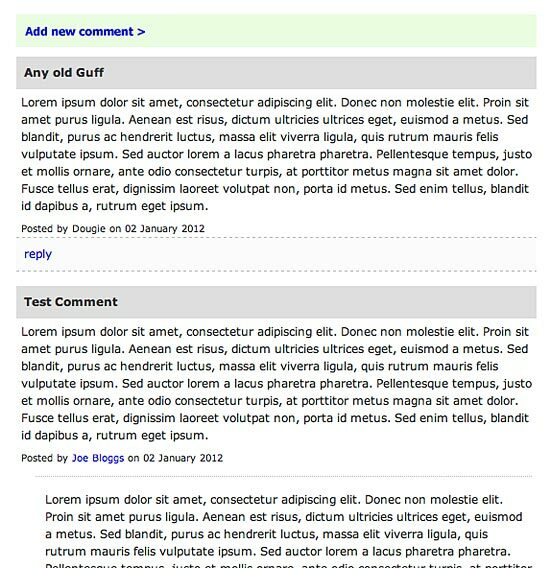 The pale green 'Add New Comment' button lets users start an entirely new topic, with form opens elegantly when clicked to reveal a full feedback form complete with fields for their name, email address, subject, and message text. As with all feedback forms in Spanglefish, the form includes a 'captcha' code to ensure that it is a real person sending the message rather than just a 'spambot'. 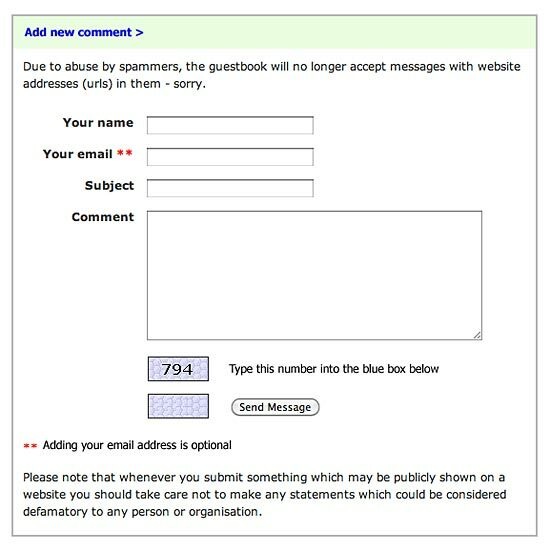 Messages left in your Guestbook are not published until you have checked them, to prevent abuse. When you are logged in as the administrator, the standard blue control panel at the top of the contnet area contains a 'Delete Spam' button, letting you check and delete multiple messages quickly and easily. As you will see, when you are logged in additional admin links below each message in your guestbook enable you to edit and delete individual messages. If there are unpublished messages responding to older threads, then the title bar of that message is highlighted in yellow, and you can click on this to expand the view and check the new message ready for publishing.